Opinion Place is an online survey site that is free and available to anyone wanting to provide their opinions and in return receive rewards. 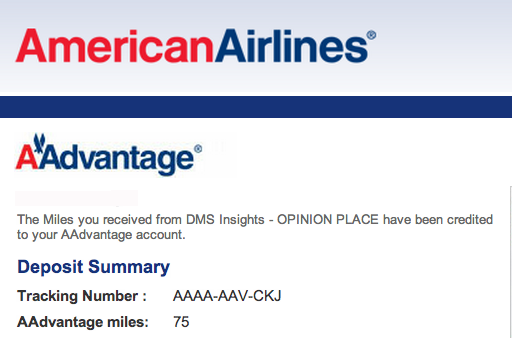 I’ve been using Opinion Place for a few months and I can happily report that it offers a painless way to get free money, gift cards, or American Airlines AAdvantage miles. Once a week, you can qualify for a survey. If you aren’t qualified, you can try again in 1 day. Each survey runs about 10 to 15 minutes, some are shorter and some can be longer. Longer surveys can earn higher rewards. 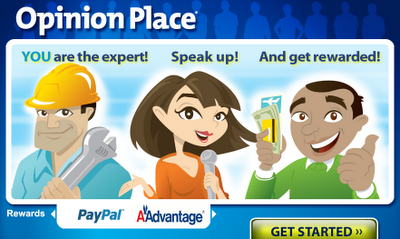 Prior to each survey, Opinion Place will tell you about your reward offered. If you qualify and complete a survey, you will usually receive either $1 to $5 in Amazon.com gift cards, $1.50 to $5 Paypal credits, or 75 to 150 AAdvantage miles. You get to choose the reward that you want. Paypal, Amazon gift certificates, and AAdvantage miles post within 3-4 weeks of survey completion. Higher rewards may be offered if you’re asked to participate in an in-home product test or longer surveys or special research activities. Each Household/family may only have one member who may try to qualify for or participate in Opinion Place surveys. I participate in a lot of online survey sites, and Opinion Place is one of my favorite, for its ease of use and quick payment of AAdvantage miles. You’re not going to earn enough miles for a free flight, but every free mile helps. I'll post more sites that offer free money and miles in the future. Until then, you can sign up at www.opinionplace.com.